One of our primary goals is sharing the animals with children and adult visitors. Our classes and tours teach respect and strive to improve people's understanding of the nature of wild creatures. As a sanctuary, we need to teach in such a way as to allow the animals to feel safe and non-threatened- first and foremost, this is their home. Before approaching the animals, visitors are taught how to avoid any actions that may be perceived by them as a threat. Some of the animals are in areas set farther away from where we will be teaching due to their own comfort level with visitors. Other animals will be able to walk up to the fence and come quite close if they so desire. I believe that we (humans) have long forgotten the "language" of animals that we once knew. I don't use the term language to describe the spoken communication that we know of today, but rather the gestures and body language that all animals use to communicate with each other. When we became able to talk and developed our spoken language we stopped observing or "listening" to the subtle gestures of the animals. 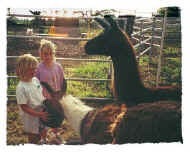 At the Three Ring Ranch we hope to open the eyes of our guests to this very interactive communication. We all "speak" to the animals as we move, talk and watch them. The animals quickly interpret our behavior and act on what they see. Some of them view us as potential threats or rivals. Thus, by turning our bodies in a non-threatening way, we can reassure the animals and allow them to act more naturally and less fearfully. As an example, we can avoid a face on approach with direct eye contact and move with a slow side-to-side swing to our walk, instead of a straight on approach- this is because both these actions convey non-predatory behavior to hoofed stock. We teach two sessions in the children's regular classroom and then host a field trip to the sanctuary for the final lecture. By teaching in three parts we hope that children will not get overwhelmed with the material and retain more of what we are teaching. We have a wide variety of guest speakers including veterinarians, biologists, animal trainers and keepers who will be joining us as their schedules allow for the final lectures. The classes I am teaching school children involve role-playing to help them understand how the animals view humans and other predators. Animal care, habitat conservation, preservation and genetic diversification in captive populations are all among the topics we began focusing on in 2000. At the early point in our program development we taught small groups of children and then interviewed them several weeks later to see what information had been retained. It is very exciting and gratifying to hear them describe in their own words what they have learned. Slowly the program has evolved to better suit the community and each student's age group. Single course programs are available for younger children, libraries, conferences, exhibits or other educational venues where wildlife or conservation education is welcomed. Comments, ideas and feedback about our educational plans are welcome. Currently, we focus primarily upon children between the ages of 8 to 11 because that appears to be the age where we can make the most difference through education. After school mentors are school children, 12-13 years of age who come up one day a week, in small groups, to learn basic animal care and conservation. These children become junior keepers. They learn animal communication, to provide behavioral enrichment, proper nutrition for captive creatures, wildlife care to name a few. As their own skills grow their own confidence increases. 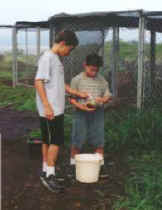 They become leaders and eventually teach other students the skills they have learned. Their program runs for 10 to 12 weeks. Any local student may apply by following the link to the application and info page. We also host special sessions for adult members of our community who are interested in the animals and what it takes to keep them happy and healthy. Call or email the Sanctuary to set up these programs. We try to fit as many of these in as possible but can not make any guarantees of availability. We offer open days that are advertised on community bulletin boards and over public radio. These will be offered several times a year as well as several training sessions for our volunteers and new recruits per year. The Sanctuary offers both internships for pre-vet students and summer externships for second year vet students. We are currently affiliated with all veterinary schools in the United States, Australia and New Zealand. We welcome other students if space is available. Students are selected early each year for two 3-5 week summer programs. Our interns have been 100% successful in entering into a veterinary college! We welcome comments and ideas from educators and parents as to what topics you feel children will be interested in and techniques you can recommend for teaching them.